Pioneering Lancashire-based food producer discovers significant new revenue streams! Thanks to substantial back-payments and lower future energy bills. The dairy industry is known for its high energy consumption but forward-thinking cheesemakers, Dewlay, have sustainability at the heart of their business, and Accounting for Energy were delighted to help them maximise the benefits from their renewables. Dewlay were happy with the comprehensive information that their wind turbine operator provided, who they have successfully worked with for many years. However due to the complexity of the renewable energy industry and constantly changing price tariffs, it can be extremely difficult to know when additional revenue sources are not being captured, which is where Accounting for Energy were able to help through the audit. Understandably Dewlay wanted to ensure their relationship with the site operator would be protected so Accounting for Energy worked alongside them to ensure this would be the case. The site operator was also very helpful and provided information quickly. The owners of this family-owned business are third generation brothers Nick and Richard Kenyon, and they pride themselves on their longstanding reputation for great foresight, vision and for producing Lancashire’s finest cheese. They were able to continue their business as usual, while Accounting for Energy worked in the background creating all the historical analysis with clear audit findings that could be easily presented to the site operator. Communication was key during the audit and Accounting for Energy agreed a clear timetable and kept Dewlay fully updated throughout the entire process. Accounting for Energy secured a seven year back payment of income on behalf of Dewlay, which was equivalent to an entire year of rental income. Rental income increased by 20% in 2017, as a direct result of Accounting for Energy’s review. Accounting for Energy increased Dewlay’s rental income by 30% during one of the seven years Accounting for Energy reviewed. Moving forward, Dewlay’s annual rental income is expected to increase by 12% per year. Accounting for Energy’s detailed SWOT analysis will assist Dewlay to maximise the future benefits from the wind farm. 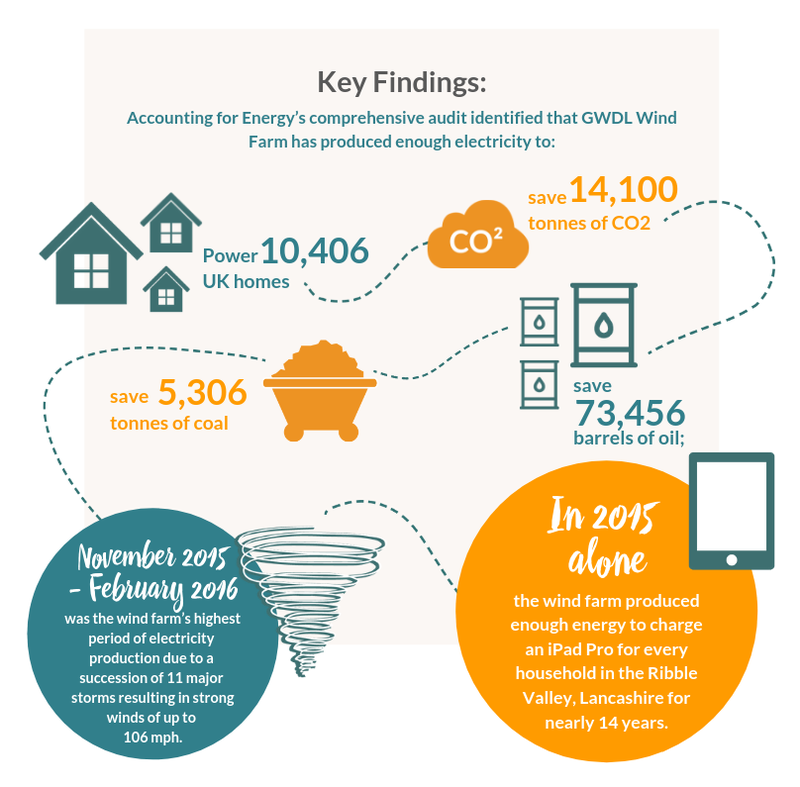 Accounting for Energy’s comprehensive audit report gave Dewlay a deeper understanding of the wind farm’s historical performance and its contribution to the local environment. Upon the request of Dewlay’s CEO, Nick Kenyon, Accounting for Energy calculated their costs savings for each turn of the wind turbine.